There’s a purposeful foggy dark atmosphere to this magical new adventure from Michelle Harrison, award-winning author of The Thirteen Treasures, which makes it all the more mysterious and adventurous. Set on a series of fictional islands, often enveloped by a ghostly mist, and surrounded by marshes and rocks with the nearest neighbour an eerie prison, this is a tale of curses and sorcery, of magical objects and imprisonment, and yet through the fog, a tale of sisterhood and teamwork, boldness and bravery shines brightly. The three Widdershins sisters, Betty, Fliss and Charlie, dazzle like a ray of sunshine in the mist, living and working with their grandmother in a busy pub. From the rowdy beginning on the night of Betty’s 13th birthday (unlucky for some), she and Charlie are first encountered galloping down the stairs, Halloween costumes billowing, dancing happily. The sisters are bubbly, proactive protagonists, particularly Betty, the novel’s focus, and she’s an absolute gem of a heroine. On her birthday, Betty learns that her family is cursed, and she endeavours to break the curse and set them all free. 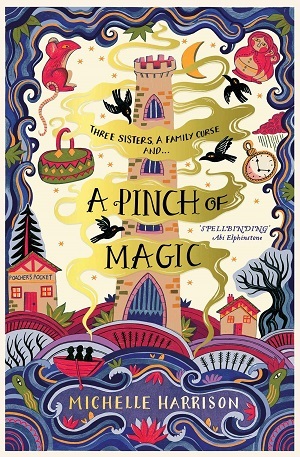 The three sisters each possess a magical object that has been passed down to them through their family heritage – a carpet bag, a set of wooden nesting dolls, and a gilt-framed mirror – all of which they can use to help break the curse. In children’s literature there are many enchanted objects that have a role in directing plot or character, and the more ordinary the object, the more exciting their magic. A wardrobe perhaps (The Lion, The Witch and the Wardrobe), a ring (Lord of the Rings), or a mirror (Snow White). Here, the bag feels Mary Poppins-esque, and does indeed go deep. The mirror may be seen to be vain, but holds power, but Betty’s object is the wooden nesting dolls – which have always felt slightly spooky and enchanting to me – the hidden quality, the addictive nature of lining up the seams. 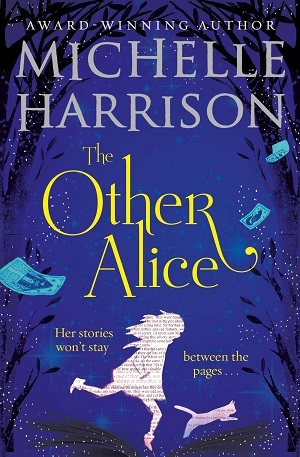 Harrison has great fun weaving the objects’ magic abilities into her narrative, but the bulk of the plot centres around the strangely powerful and dark prison. Believing a prisoner holds the key to breaking the curse, Betty endeavours to bargain his freedom for the answer, only to discover that it’s very easy to make mistakes on a prison break. With a delightful cast of prison villains, shadowy wardens, and suspicious townspeople, the atmosphere simmers with menace. To embellish the story, and the atmosphere, Harrison has a special attachment to names. The three sisters live in The Poacher’s Pocket on the isle of Crowstone. Their surname, Widdershins, means to go in the wrong direction and is considered unlucky. Crowstone belongs to the Sorrow Isles, among which are the isle of Repent on which lies the prison, and the isle of Lament with its graveyard. These small details punctuate the text providing atmosphere and portent. But with three intrepid brave girls working together, a rat called Hoppit and a cat called Oi, the darkness of the setting is always going to be overwhelmed by the beauty of the girls’ inner natures – their ability to help others when necessary, pull together in times of conflict, and use their wit and intelligence to break their curse. Harrison writes with more than just a pinch of magic – this is a compelling magical adventure that spellbinds the reader into believing in a whole other world, and understanding that envy, betrayal and prejudice are the real evils, whereas foggy marshes and spooky crumbling prison towers are merely landscapes. A rich, charming tale for ages 9+.